‘Seto Bagh’, meaning ‘White Tiger’, 1973, written by Diamond Shumsher, revolves around the life of the Jagat Jung Rana, the eldest son of Jung Bahadur Rana. The plot is set around the time when Jung Bahadur Rana was in power and after his demise. It has been translated into French, English and Japanese. 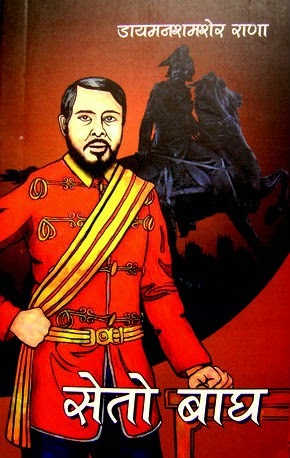 The novel describes Jung Bahadur Rana losing his grip over the control of the palace and also the fall of his sons and the rise of his nephews to power. However, the novel is like a sequel to Diamond’s previous novel ‘Basanti’ where he wrote about the rise of Jung Bahadur along with his love life. Seto Bagh is more like a biography of Jagat Jung. It describes the love relation between Jagat Jung and the Princess, the daughter of King Surendra Bikram Shah. The novel starts with the mention of ongoing war between Nepal and Tibet. As the war proceeds, the love story between the two goes along. It describes the emotional state of Jagat Jung as he fights the urge to accept the Princess’ love. The fear of being called a sinner and cheat for stealing his cousin’s fiancé being greater than the courage of accepting his own feelings for her, he tries his best to make her hate him. Listen and Download "Seto Bagh" on the voice of Khagendra Nepali.